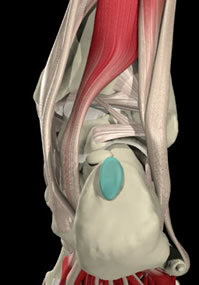 Patients mainly complain of pain posterior to the ankle on loading or in equinus. The pain sometimes radiates up the leg or down the course of the FHL tendon. Some patients complain of catching, locking or giving way. Occasionally the pain may be difficult to distinguish from that of Achilles tendonopathy. There is posterior ankle tenderness which is worse in plantar flexion. There may be some swelling or synovitis, and the range of plantarflexion is often reduced. Pain provoked by hyperextension or resisted plantarflexion of the great toe suggests FHL tendonopathy. A manoeuvre analogous to the Molloy test for anterior impingement is usually positive, although the sensitivity and specificity are not known for posterior impingement. Posterior Molloy-Bendall type test for impingment. No data on accuracy.